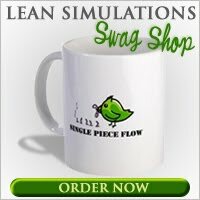 Lean Simulations: Lean Accounting - The value stream wins! Lean Accounting - The value stream wins! I guess I've been doing a series on Lean Accounting. After the last two posts, I decided to look for some more in depth information on Lean Accounting. The site www.maskell.com gives a plethora of information on the nitty gritty numbers. I'm not an accountant, so most of the higher level number crunching goes beyond me. But even I can understand a lean P&L statement. At the bottom of this article about Lean Accounting methods, there is a side by side comparison of a Lean vs Traditional profit and loss statement. It is completely clear in the lean statement how much is being spent on procurement vs conversion, so any improvement activities are immediately evident on the bottom line. Whereas the traditional statement has "adjustments," "margins" and "other costs." Only a finance guy knows what that means (refer to subsection blah blah, part 3A for further details...). The lean accounting movement was born of frustration. It's true that many Lean initiatives don't directly hit the bottom line. And that's where the challenge lies with accounting. Where's the immediate payoff? By looking at the entire value stream, costs are captured across different products. I.e. if an existing machine has capacity, you can factor that into the lean accounting method, while in traditional accounting, you would still capture the entire burden of the machine. On maskell.com, there's a huge amount of information. I especially like the examples showing lean accounting at work. There's a series of articles called Stories from the Field, which give real lean accounting examples including making pricing decisions, value stream analysis in retail and manufacturing, quoting, and accounts payable value streams. This is where the gold is, learning with real examples. There's also a larger Powerpoint presentation on Lean accounting, as well as video interviews and many other articles. If you're interested in more Lean Accounting training tools, check out my other posts including this video series and this slideshare presentation.